Does your family offer you interesting challenges when it comes to eating healthy? Maybe not your spouse or children, but maybe your other adult siblings, parents (or in-laws), or even your friends or co-workers? If not stop reading, but for those of us who don’t live in a health retreat proceed ready to nod and eye roll. I am not pretending that I or my immediate family eat perfectly; whole grain bread or crackers check, fresh fruits and veggies at every meal check, lean meats check, use of coconut or olive oil exclusively check, labels that have only things that I can pronounce check, daily whole food organic vitamins for everyone check, pizza Friday check. We do pretty good, living by the “if it has more than 25 ingredients on the label, a shiny bag, or especially if it came through a window, avoid it” code. There are however times when we eat with relatives that I almost expect a heart attack before we leave the table. That being said when I go to someone else’s home I do not criticize whatever is on the menu I just eat. Definitely not seconds or even a full portion, but Gramma didn’t raise no rude baby. When you come to my table I expect the same. Recently I have been hitting the day job pretty early so have had to get some help getting little people to school. 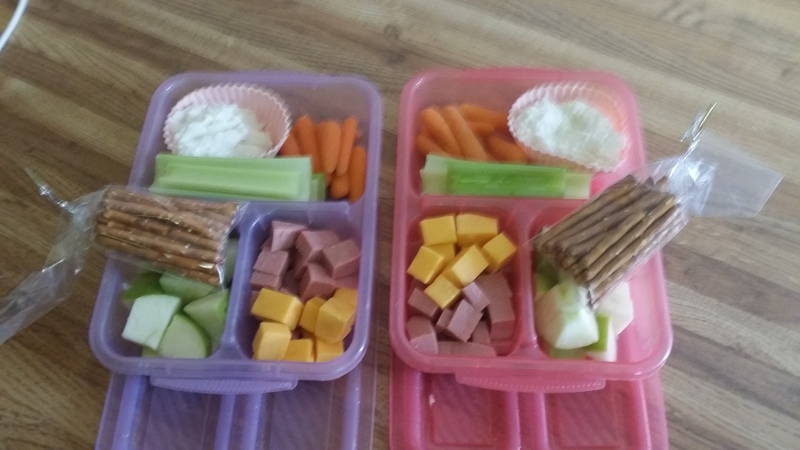 My older girls pack a lunch every day because public school lunches have gotten out of control (new federal guidelines have driven prices way up and edibility way down) it runs $3.50 a lunch- per child which comes out to $35 a week, we can do better. We have plenty of fresh fruit, dip-able veggies, kid friendly greek yogurt, whole grain crackers, nuts, and lean meats to stick in the box. On day two we ate dinner with the helping family members. Right after dinner they bring out grocery sacks full of junk food. It was terrible; individual sized bags of chips, cookies, fake cheese filled crackers, snack cakes, puddings all things that we try to avoid! Telling me that they were concerned that the girls might not have enough time for packing a lunch. Yes it does take a few seconds longer to scoop the peanut butter into a reusable tub or give the veggies one more rinse than to shove a bag of chips and pudding into a bag, but this is our lifestyle and the health of my kids is my business. The girls are also pretty good at grabbing their favorites while I whip up an omelet or fruity oatmeal for breakfast (Seriously it takes 4 minutes to make a fresh omelet and 6 for steel cut oats with honey and fruit). Of course I lost it internally but when I reminded my helpful family that we don’t eat those types of foods because diabetes and heart disease run on both sides of our family and we want the girls to prefer healthy foods so when they are adults they don’t worry as much about their waistline as I have had to do. There was of course the “we only got this because we love the girls” and “don’t you think that they deserve dessert?” on top of the “all that healthy stuff is nonsense, we ate chips every day and turned out fine”. This happens more than once a month, both my husband and I grew up in the South in the late 1970s and 1980s. Our diet often involved deep fried things, pounds of butter, and as much red meat as the Bradys. Both sides tout medical histories that have repaid more than one doctor’s medical school loan (and bankrolled that Mercedes in the parking lot too.) So my perpetual vigil to maintain a healthy menu is criticized at every opportunity, sometimes in the same breath that a relative will ask for weight loss advice. I am not perfect, and neither is my diet. My family eats 80% clean and 20% splurge but we want those splurges to be really worth it- a slice of good cheesecake versus a bag of Doritos. I take a few hours out of my week to prep broccoli, cauliflower, celery, and carrots. I drain phone battery with grocery apps to ensure that I get the best price on blueberries or babybells. I have my moments of weakness- usually hungry after running when I hit the local Dollar Store where I park my car for bread. (Did you know the freakin Dollar Tree carries Natures Own whole grain bread??) I am realist and I love my family but sheesh you take your chances and I will take mine as far as nutrition goes. I am always on the lookout for ways to politely deflect the helpful suggestions on how to feed my kids or how often I hit the gym so please feel free to share your story.